A major concern these days in some industries with high turnover is - yes and alas - the increasing rate of turnover and the one of payroll. External environmental factors, mostly recent or lingering changes in legislation, have indeniably contributed to the facts, What are businesses to do? Creativity, and more creativity in various formats, and marketingbuzzes take the lead in many organizations. But external, environmental factors aren't the only ones affectiong turnover. Internal factors play the most part. Let alone compensation and staffing policies, what if your conflict management method create more conflict than not? Impossible? Improbable? Debatable. 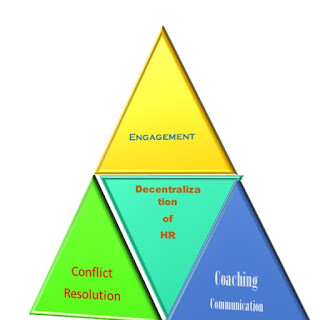 The matter of decentralization of HR is a pandora box: you never know what the outcome will be, It is here and one cannot avoid it like the Bermuda Triangle. Parlant de Violence sur les lieux de travail. Une affaire RH devenue une affaire d'Etat. Quand les syndicats sont concernés, les questions RH deviennent-elles des affaires d'Etat par la force des choses/Evènements/de la violence?